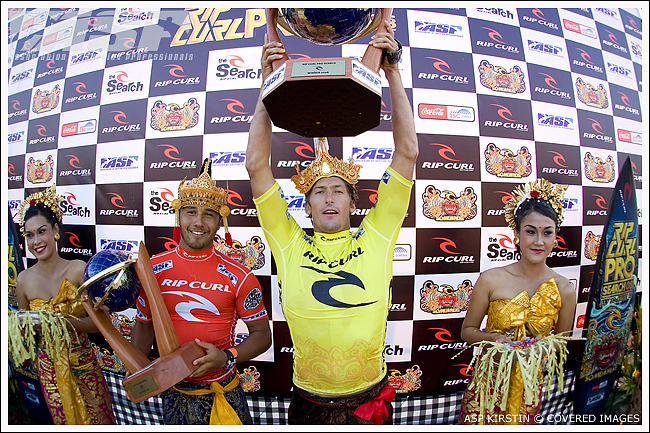 Bruce Irons Wins The Rip Curl Pro Search 2008 "Somewhere in Indonesia"
Sunday, August 3, 2008 - Bruce Irons (HAW) has defeated fellow finalist Fredrick Patacchia (HAW) to claim the 2008 Rip Curl Pro Search in rifling four-foot (1.5 metre) lefthanders ‘somewhere’ in Indonesia. Stop No. 6 of 11 on the 2008 ASP World Tour, the Rip Curl Pro Search saw a marathon day of action capped off by a stunning barrel shootout finale between the young Hawaiians. Irons, who took down reigning ASP World Champion Mick Fanning (AUS) and Dream Tour sophomore Ben Dunn (AUS) en route to his Finals berth, came from behind in last 10 minutes of the event, grabbing an 8.33 and a 9.33 to scalp his first ASP World Tour victory. The progressive natural-footer eased into the Final against Patacchia grabbing small scores before unleashing a fury of backhand tubes and commited re-entries over dry reef to take the win and move into No. 10 on the ASP World Tour ratings. Irons maintains the family monopoly on Rip Curl Pro Search events, joining older brother Andy, who has two Rip Curl Pro Search titles (2006, 2007) under his belt already. Patacchia was in stunning form all event, netting high scores and eliminating top seeds before coming up short in the Final. After suffering an injury early in the season, Patacchia has since rebounded, finishing equal 9th in Fiji and Jeffreys Bay before his runner-up finish ‘somewhere’ Indonesia. The stylish goofy-footer now sits at No. 14 on the ASP World Tour. Chris Ward (USA) was another who was in blazing form all day, eliminating former three-time ASP World Champion and two-time defending Rip Curl Pro winner (2006, 2007) Andy Irons (HAW) and 2007 ASP World Tour runner-up Taj Burrow (AUS) before coming up short against an in-form Irons. Tiago Pires (PRT), 2008 Dream Tour rookie, put in the best performance of his young career, dispatching of eight-time ASP World Champion and current ratings leader Kelly Slater (USA) in Round 3 before rampaging through to an equal 3rd place finish. With the early elimination of the majority of top seeds on the Dream Tour, current ratings leader Kelly Slater (USA) maintains a healthy lead on this year’s ASP World Title race. The next stop on the 2008 ASP World Tour will be the Boost Mobile Pro pres. by Hurley at Lower Trestles, California from September 7 – 13, 2008.